At least 18 people have been killed after a truck ploughed into a crowd in Guatemala. The victims were looking at the scene of a previous accident in the western town of Nahuala when the truck struck them late on Wednesday. The driver then fled the scene. The ministry of health said 19 people had been taken to hospital with injuries. Guatemala's government has declared three days of national mourning. The truck driver escaped the scene after the incident, but police spokesman Pablo Castillo said the authorities managed to capture a suspect following a high speed chase. A 28-year old man identified as Pedro Rene Lorenzo Lopez was in police custody, the spokesman added. 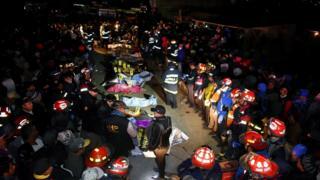 Guatemala's president Jimmy Morales wrote on Twitter: "At this time we are co-ordinating our response to bring full support to the relatives of the victims. My heartfelt condolences."